It is that time of the year when nationalist sentiments are on rise and we have flags on our profile pics displaying our love for the nation. Many of us have loaded our playlist with as many patriotic songs as we could find to get into the mood of the day. Some like me have been waiting for this day for almost a week looking forward excitedly to witness the main function of the Republic Day – The Parade on Rajpath. Now the smartly dressed contingent of military, the display of might of our weaponry and colorful glimpse of states are enough to make a person like me long to see the parade from close quarters. However, this time there was an added incentive – the chief guest of the function – Mr. Barak Obama – President of United States. 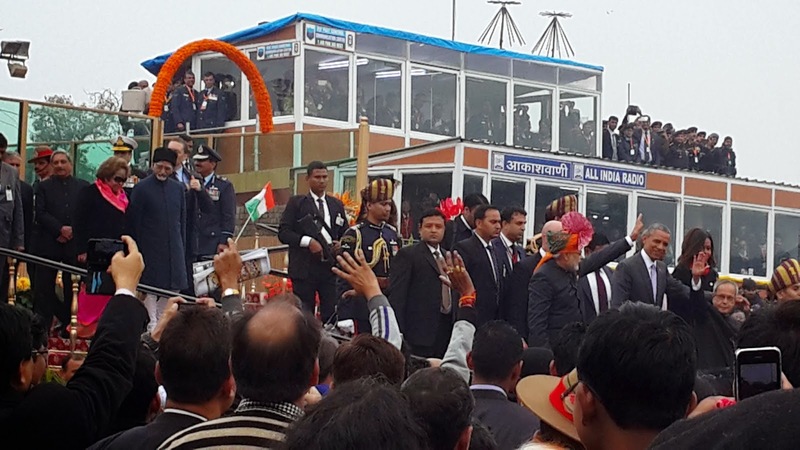 So there I was to attend the famed ceremony right amidst from where the President takes the salute of the Parade. Republic day is celebrated as an anniversary of India adopting its constitution and deciding to stay a sovereign, secular, and democratic nation. It is the day which fills every Indian with Patriotic fervor, national pride and ardent devotion. 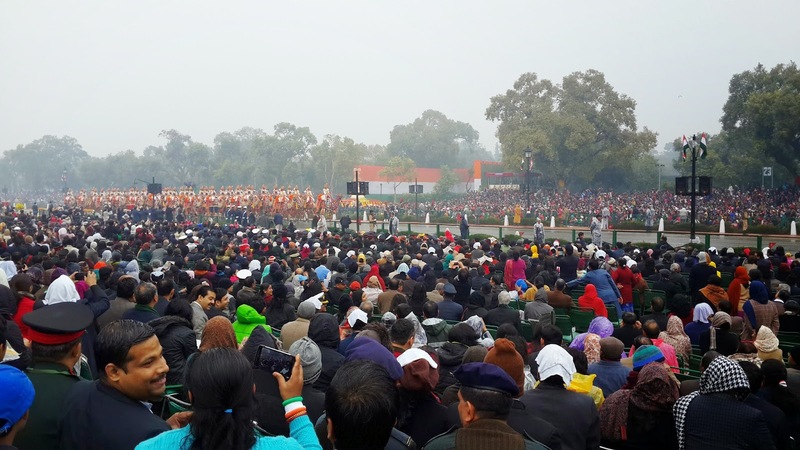 And at the national level, these celebrations are held on the Rajpath in New Delhi where the procession takes place. This parade is a symbolism of our diverse cultural fabric and robust military might at the same time and shows to the world how both these make India a strong, rich and conspicuous power in the world. The parade starts from the Rashtrapati Bhavan and ends at the Red Fort after passing though the India Gate. Huge efforts go into making this day a success and a long list of agencies toil to make arrangements right for flawless execution of the entire sequence of events that take place. And as I began writing down my first-hand experience of the attending the event, an inquisitive mind like me was bound to look around to understand what all did the Republic Day parade entail. So finally I researched some more information to “value-add” to my own experience and give the readers a more holistic coverage of this grand event. I have broken down the entire article into various buckets with each carrying my experience followed by additional context. Well, I could call myself as one of the special few who managed to get a pass of the event, which meant I was being invited by the Defense Ministry who would be “pleasured” by my presence at the occasion. Now I am not one of those who would disappoint our defense forces and hence was there to grace the occasion. This VIP invite pass allowed my vehicle to slide through the roads which were impenetrable by mere mortals. It allowed me to enter the venue in style (well not really; the country has too many VVIPs) and occupy the best rows to have a front-seat view of the spectacular display which was about to happen. Here is how the pass for the event looks like. 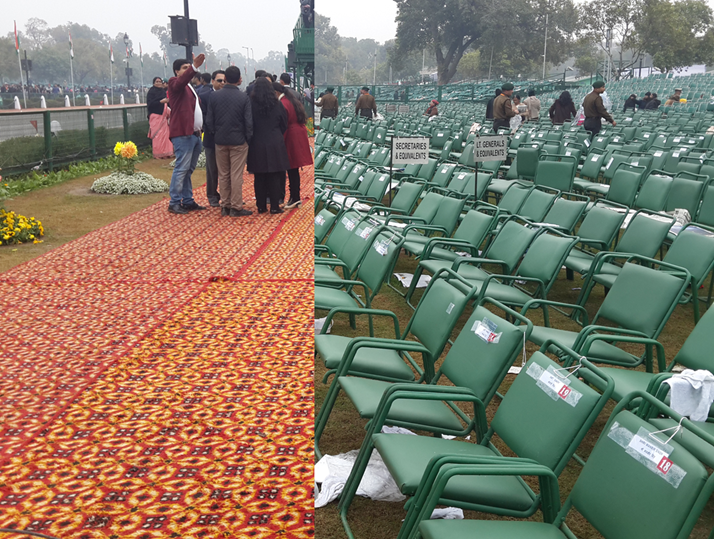 We finally entered the enclosure at around 9:30 and got seats in the second row from front which meant that Rajpath would be just feet away from us. Around the time when we took our seats, we saw the cavalcade of the PM going to lay wrath on the Amar Jawan Jyoti to pay respects to the martyrs. There were about 35 enclosures with 1,11,240 seats of which nearly 19,000 were open to the general public. Nominal tickets were charged as token for entry to these public enclosures. Two separate enclosures were reserved for children. Security arrangements for republic day are always elaborate and security forces sweep entire neighborhood carefully including sanitizing all nearby building. 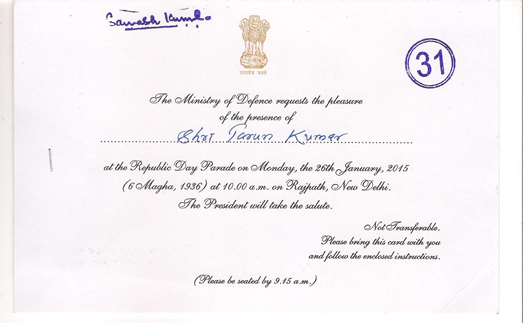 Obviously, this time the arrangements were more extravagant given the profile of our chief-guest – POTUS himself. The US Secret Service, CIA, Navy Seals and India's Special Protection Group, Research and Analysis Wing (RAW), Intelligence Bureau, paramilitary forces and Army worked together round-the-clock to ensure the safety of the two leaders of the two largest democracies who face a high order of threat from global terrorist groups. First to arrive was the Prime Minister Modi in his own stylish BMW followed by the vice-President. PM visits Amar Jawan Jyoti before coming here to the main dais for laying wrath in memory of martyrs who gave life fighting for India. Then came the Chief Guest – Barack Obama in his “Beast” to be part of the occasion. He was received by the PM along with the defense minister. At the end came the President Mukherjee himself escorted by the Presidential bodyguards on horse backs. Customarily, India invites a head of the state as the chief guest of the invite and leaders from numerous friendly countries have graced us in that position. It is for the first time that US President is the chief guest on the occasion. Till now, we never invited the US President for the Republic Day – either for lack of want or fear of being turned down. But it was different this time as PM Modi shared great repo with Prez Obama and hence he extended an informal invite when they met in Australia. Once initiated, diplomats from both countries worked to figure out the details at the end of which today, both Presidents and PM Modi observed the parade. 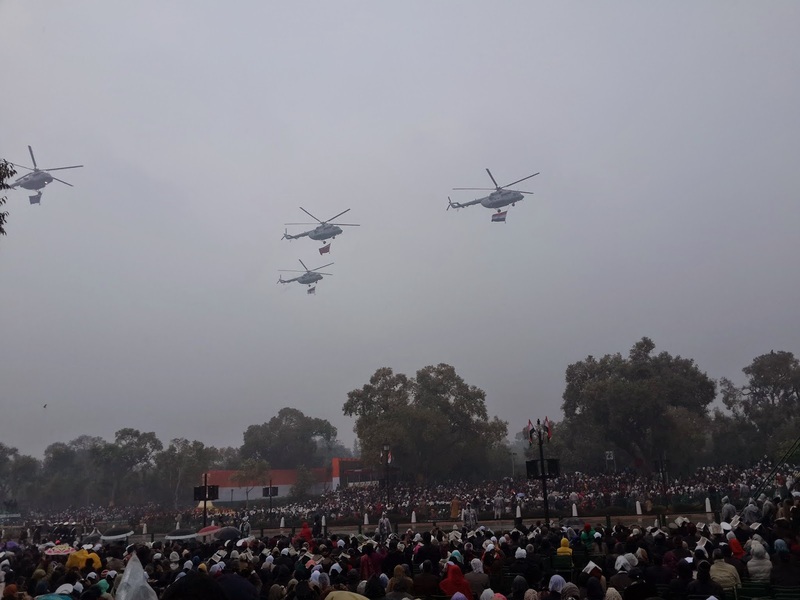 The parade began with four army helicopters flying above Rajpath displaying the tri-colour in the front and followed by the flags of Army, Air Force and Navy. The republic day parade is inherently a show of military strength and is officially hosted by the defense ministry with President as the head. The parade, post the helicopters, was led by contingents of various armed forces with the three branches of defense forces – Army, Navy and Air force - being in front. India's military might was then put on show as BrahMos missiles, Akash Surface-to-Air Missile, 214-mm Pinaka rockets, T-90 Bhishma tank, T72 Trawl and 3 Dimensional Tactical Control Radar system rolled down Rajpath. 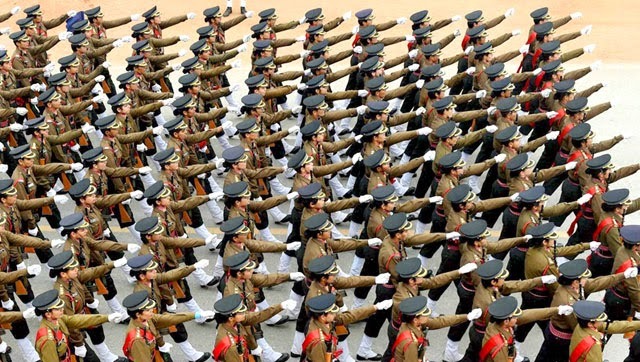 Along with modern weaponry systems, contingents of armed forces' personnel, paramilitary forces and NCC cadets marched to the beat of the bands accompanying them. Forty-five contingents in all each of 144 soldiers (12 in each row and column) marched down Rajpath one after the other. The ‘camelry’ was a show-stopper item of the contingents with about 100 camels represent the BSF’s regiment which includes over 1200 camels in Jodhpur to guard the desert frontiers in Rajasthan and Gujarat. The camel regiment is one of its kind being unique in the world. After the military strength, it was turn of the cultural heritage to be showcased infront of the guest. 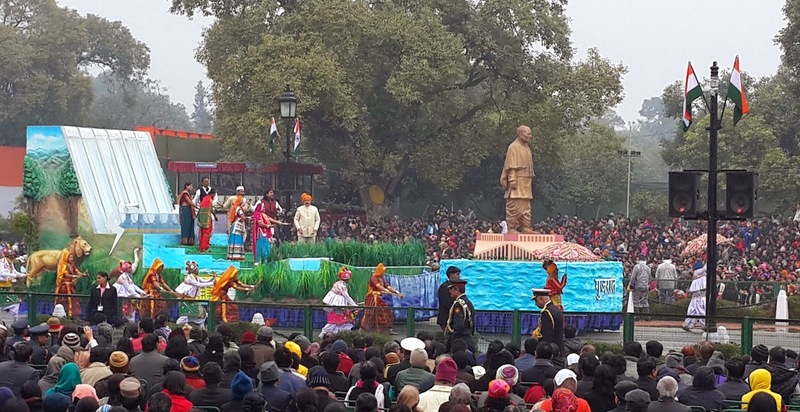 Tableaus from many states and departs of central government passed through Rajpath depicting a special theme from the particular place. Prime Minister Narendra Modi's pet projects like 'Jan Dhan Yojna', 'Maa Ganga', 'Swachh Bharat Abhiyan', bullet train and the 'Make in India' drive were in the spotlight when tableaux started passing through the Rajpath. In all, 25 tableaux, including 16 from the various states, provided a kaleidoscopic view of the country's economic strength, cultural heritage and development of science and technology. Soon after this, national bravery award-winning children seated in open jeeps joined the parade. Towards the end, the parade featured jaw-dropping stunts by Sashastra Seema Bal officers on motorbikes, who executed daredevil stunts as they showcased the double ladder, human pyramid, bouquet and chakra’ formations. The theme showed the 100 years celebrations of the Border Security Force. 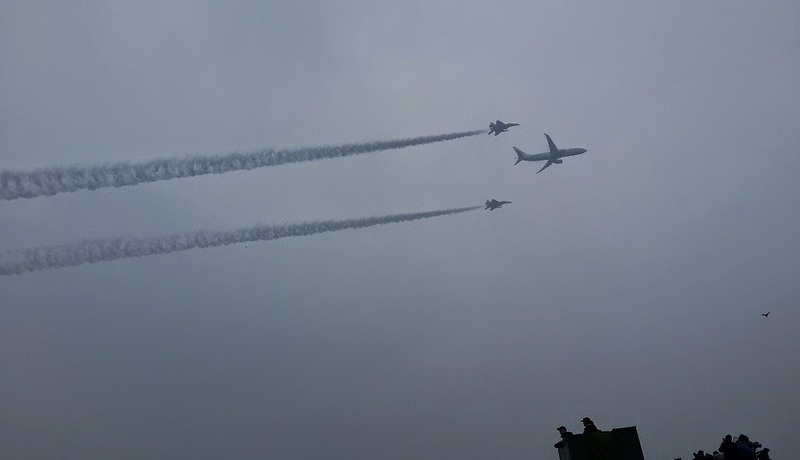 Finally the Air Force fly past concluded the entire occasion. The helicopters and fighters passing through in various formations was a sight to be remembered. Attending the Republic Day parade is an experience which can only be felt by being there and no amount of words can do justice to the entire occasion. The eclectic cheering at the brave soldiers, feeling excited to see the tanks, amazed at the fly past, cherishing the culture is something seldom seen. The huge number which gathers there to celebrate this day is definitely an encouraging sign for our country. There were many in the line for entry who had read a lot about the day and the country. People in the enclosures were excited and cheers for the country in loudest voice always found chorus from nearby enclosures. Even the usually lack-luster Delhi Police was on its toes. One of the DP personnel proudly pointed out to their contingent in the Parade saying that they were one of them. In all, it definitely is a worth attending event to participate in the celebration of us as a country. So this is it for today and I hope some of you who were curious about the ceremony and attached paraphernalia would have found the article interesting. Do pour in all you views in comments and connect with me socially for more of such interesting articles. And yeah, wish you a Very Happy Republic Day! !